Hampstead Heath is one of those places that can transport you back in time. Sometimes when I walk along its mudded pathways, littered with dog walkers and eccentric characters, it feels more like a chapter from a Thomas Hardy novel than a scene from the life of Josh Ferry Woodard. Bookmarked between the exclusive towns of Hampstead Village on the West and Highgate on the East, the Heath is frequented by some of London’s wealthiest and most celebrated citizens. But you’d be a fool to spend your time celebrity spotting when you could be conversing with the colourful locals. 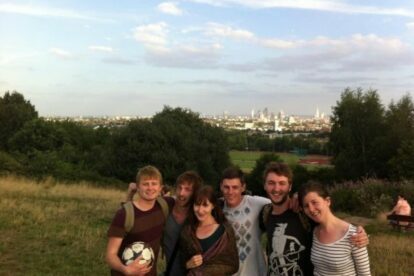 I like to climb to the top of Parliament Hill on Sunday afternoons, not only to marvel at the views of the sprawling cityscape, not only to exorcise the toxic spirits from my Saturday night hangover, but also to try and win a pound from the Heath’s very own poet laureate. With a grey beard as big and friendly as Santa Claus himself, this charismatic fellow tours the hilltop asking people to give him three words (no proper nouns!) to make a poem with. The premise is simple: if he cannot construct a rhyming poem with your three words then he will give you a pound, but if he can make up a poem – and he usually can – then the pound ends up in his pocket. His lyrical skills are exquisite and he usually leaves the Heath with at least enough money for bit of Sunday lunch.